BERKELEY, California (VN) — Nearly three years ago, Diamondback launched its carbon road race bike, the Podium. The just one year later, Diamondback signed Optum-Kelly Benefit Strategies, and the partnership is now in its second season. Now, a new version of the Podium is out, and it has garnered multiple wins already this season with Phil Gaimon taking the general classification at the Redlands Classic, Mike Woods’ soloing to win on the final stage at the Tour of the Gila atop the Gila Monster, as well as Annie Ewart and Eric Young both taking wins at the Inner Loop Road Race at Gila. 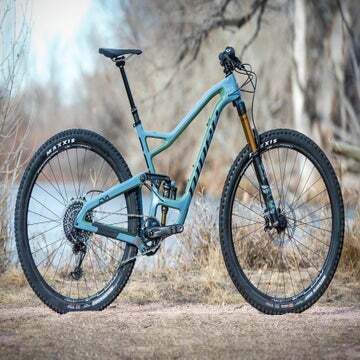 Diamondback has taken feedback from the team and used their time in the saddle to create a new Podium frame, with the help of Kevin Quan Studios — a third-party design studio in Toronto, Canada. Of course, as is the trend, the new Podium is claimed to be stiffer, more comfortable, and more aerodynamic than its predecessor. How much more aero? Diamondback would not reveal any of its numbers, but Quan did say that in Diamondback’s testing, the Podium was faster than the Scott Foil; it was about the same as the Trek Madone, and slower than a Giant Propel. Based on results from our own VeloLab testing at the A2 wind tunnel, and the Podium’s modest tube shapes, we’d expect that the Podium is closer to the Foil, than the more drastically-shaped Propel in the race against the wind. The Podium shares several tube shapes with the Diamondback time trial bike, the Serios, but the tubes on the Podium are not drastic air-foil shapes. To maintain ride quality, most are blunt Kamm-tail tubes, such as the down tube. The rear triangle is the most dramatic part of the redesign, and closely resembles the Serios, with arched (or swoopy, if you prefer) seat stays to better cut through the wind. The previous Podium was available in two different carbon frames, higher-end and lower-end, but the new Podium only comes in a single frame, with three different builds. New models start with the $2,700 Podium E’tape, equipped with Shimano 105 and Hed Flanders C2+ wheels. The $4,500 Podium Vitesse that we rode is equipped with full Shimano Ultegra and Hed Ardennes Plus wheels, and at that price, it’s the best bang-for-the-buck in the line. The flagship model, the Podium Equipe, is $7,500 with Shimano Dura-Ace and Hed Stinger tubulars. These first rides are always tricky. New bike. New roads. New group of people. Still, I was able to get out for a couple of hours on the Podium. Right away, the geometry felt like a race bike should. My 56cm Podium test bike sported a head tube height of 165mm, which is still not shortest in class — in fact, the Specialized Tarmac is 5mm shorter, and a Felt F2 is 140mm. Riders needing a more aggressive drop may have to use a -17 degree stem, or get creative with headset selection. The overall ride is not that unlike the previous Podium, which is a good thing. I will say that the new Podium is comfortable for a race bike. It doesn’t beat up its pilot, though the 2014 model was also a comfortable bike. Based purely on the beefed-up size of the new Podium’s PF30 bottom bracket shell and chain stays, I would guess that it would feel noticeably stiffer if ridden back-to-back with its predecessor. Out of the saddle, especially at high speeds, the Podium responded well. It felt like a race bike should. One sticking point — and it was above-and-beyond annoying during our ride — was the rear brake cable housing, which rattled against the inner walls of the top tube. The rear brake cable uses a full-housing routing. With the cable housing being perhaps a bit too long on my test bike and lacking a foam cover, the rattle inside the frame over rough roads was distracting. Unfortunately, the rear brake cable plugs in the frame are not removable, so sliding a foam sheath over the housing has to be done behind the head tube, in the top tube, with the fork removed. Overall, the new Podium is an exceptional bike. The Podium packs some bang for the buck, especially the mid-level model equipped with Ultegra. I look forward to taking it through the wringer on home roads and at some races. Editor’s Note: Diamondback paid for travel and accommodations for attending journalists.